In this class each student will transform deerskin and an eight-sided wood frame into a powerful personal, large drum and beater linking the student to the spirit of the deer and the earth which all things come from. For thousands of years deer hide has been used by native people for many things including spiritual objects such as the drum, shield and rattle. Class is at John's house in Crownsville. Please pay in full to John to reserve your spot. 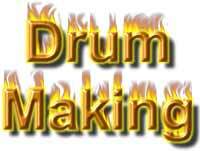 Call John to arrange your own private drum making class at any time! Call John, email him at: fishbacknature@verizon.net or write to John to sign up now or for more information at: 410-440-9356.